Please join us for a special engagement at Rock’s Roadhouse / Feather River Hot Springs. Concert at 7 pm, dinner, drinks & dessert available. A benefit concert sponsored by Plumas Audubon Society. 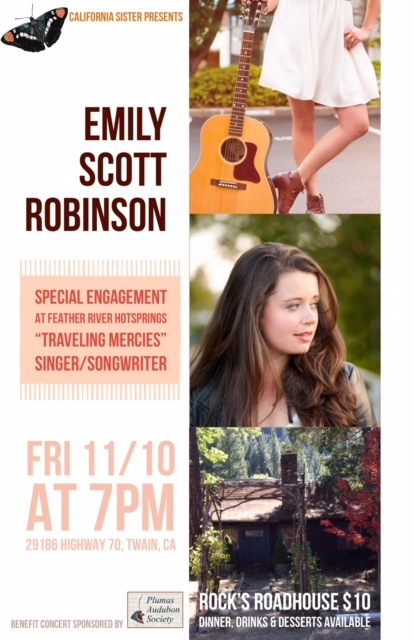 With an angelic voice and lyrics laid bare, Emily Scott Robinson is pioneering her own brand of roots music: Southern Gothic folk. She enchants her audiences with stories and songs that are equal parts playful, darkly funny, heart-wrenching and redemptive. In 2017, Emily was featured on PRI's show "The World" for her single, "Traveling Mercies." She was also named a winner of the 2017 Wildflower Festival Performing Songwriter Contest. In 2016, Emily won the Grassy Hill New Folk competition at Kerrville Folk Festival, in addition to an Honorable Mention in the 2016 Telluride Troubadour Contest. In 2015, she won first place and her Gibson guitar in the “American Songwriter” May/June Lyric Contest, as well as an Honorable Mention in the Rocky Mountain Folks Festival Songwriter Showcase. Emily released her debut album, “Magnolia Queen,” in February 2016. She is currently touring full time, living on the road with her husband in their motorhome, writing and performing across the country.